How Much Would You Pay for a Larger Kindle? Lots of people have been wishing for Amazon to release a larger Kindle, especially now that Kobo offers the Kobo Aura One with a 7.8-inch E Ink screen that has turned out to be quite popular. Amazon currently sells four different Kindles and all of them have the same size 6-inch screen, and three of the four have the exact same 300 ppi E Ink Carta screen, so something a little different would be a welcome change. But how much would you be willing to pay for a larger Kindle? Amazon’s current pricing structure doesn’t leave much room for a larger Kindle to be competitively priced with the Kindle Oasis selling for $289 and up. If Amazon were to release a 7.8-inch Kindle like the Aura One, how much would you be willing to spend? What if they came out with a 7.8-inch Kindle Voyage, for example? The current 6-inch Kindle Voyage starts at $199, and it’s been on the market since 2014 so it could use a refresh. I think Amazon might be able to get away with charging $299 for an 8-inch version, but $249 would draw in a lot more buyers. The 7.8-inch Kobo Aura One sells for a very competitive $229, and it’s actually closer to $200 USD if you order from Chapters.Indigo in Canada because of the exchange rate, even when paying extra for shipping. But would Amazon be willing to charge less for a larger Kindle than the Kindle Oasis? Even though it comes with a cover, the Oasis really throws a wrench into the pricing equation. I doubt Amazon could charge more than $299 for an 8-inch Kindle and have much success with it, especially up against the new 32GB 9.7-inch iPad that’s already on sale for $299 at Staples. At $249 I think a lot more people would be willing to upgrade to a larger screen, but it’s hard to imagine Amazon pricing it that much lower than the Oasis. What’s your take on the subject? How much would you be willing to pay for a larger Kindle? I would not be willing to pay any more than the Aura One would cost me. If they charged more than that, I would just get the Kobo especially since it enables direct library borrowing capability. I doubt Amazon would have that feature. I have been waiting on getting a Kobo until I see if Amazon comes up with a similar screen size. I definitely want e-ink for reading books and would not be interested in using the new iPad or any tablet for that. I think the only thing that would convince me buy a new Kindle e-ink reader is if it had integrated audio, with the ability to play white noise or Alexa narration. I love my Voyage best even though I have tablets and Fire Kindles. Personally I do not need a larger device. But Like Amy says I would love some audible and Alexa integration. A kindle with an upgrade, in all characters, with a bigger screen 8 or 9,7 or 10 or 13,3 inch, with carta, and 300ppi. With sd card. With audiojack. A better software for includes another native formats: Doc, docx, epub. Like other models, with different qualities. For example: Max 13,3 is not Touch, and only 150ppi. The Max 2 or carta, 207ppi. Without lights. With android, some app can be used if you can install app store from google, g…der. But the same features than previous version. May be, not enough. It’s like Smartphone: Wins some cámara. Lost screen. Or memory. Only partial upgrade, with partial upgrades. Thank you. I do want audio back in the Kindle line – especially now that Amazon owns Audible, and you can have text, audio or both versions of a book. I would also like to see the return to a more rectangular format – the almost square shape of the Oasis cuts down on the readable text on a page compared to a paperback. Still I do appreciate the weight and portability of the Oasis. As for really larger Kindles – not interested. I an very interested in improved versions of the iOS and MacOS Kindle software – that would make my day! I’d just be happy with a larger plain Kindle e-reader 8″, 10″, 12″. Forget about all the extras: frontlight, sd card, audio, page turn buttons, better software, etc. Those features are nice but the screen size is the most important part of a e-reader to me and many others. I guessing in all reality the reason the cost is so high for larger e-readers is basic supply and demand. I don’t believe manufacturing cost of a 8″ or 10″ screen is hundreds more per unit. Since a normal Kindle is $80 with occasional sales, I’d be willing to pay in the $100-$120 range for a larger basic e-reader. I would then wait for it to go on sale for $80-$100 or buy a refurbished one for $60-$80. I would want to spend no more than what I spent on the Kobo Aura One. If Kobo can make a great larger reader for $229 then Amazon can too. Though my purchase thru Chapter/Indigo cost $179. With the latest firmware from Amazon being unable to hack (jail break), a larger Kindle would not interest me at all. I’ll stick with my modified Voyage, and my collection of Kobos. I’m looking forward to the 2nd edition of the H2O. I would be happy with an update to the Kindle DX that would add a bold font. I would happily spend 329 for a 7.8″ Oasis with 8 GB of Storage. I have a large library already(some sci-fi etc. only available on Kindle) and Overdrive library selections and lending in Maryland and D.C. have really improved. I would pay 400 dollar for a larger Kindle BUT only If it has more possibilities to change the fonts options and the margins (like Kobo’s do). I’m not interested in a larger reader, so I don’t have a price point I’d consider. I would rather Amazon work on the features for their existing readers. I would pay $600 for a 13.3 inch E-Reader with multiple formats besides their own: Doc, docx, epub, mobi, txt, pptx etc. Given Amazon owns audible, audio would be a pleasant surprise. Also a resolution of 207 PPI or higher and a memory card slot are a must. For an 7.8 inch E-Reader I would definitely not pay over $249. However it is improbable Bezos will even consider larger e-readers as long as his e-book market share is not in jeopardy. So it’s up to Amazon’s clients to force to force a policy change. I strongly prefer 8-inch screens, but I would not buy a Kindle as I find them too limited. There are several types of e-ink tablets, starting at 180$/€, with full Android, audio support, and a frontlight. As Kindles are much more limited in terms of what you can do with them, I think a reasonable price would be under 150$/€. Android ereaders also have more problems, battery life takes a hit, there’s​ less refinement and reading-specific features, and you’re stuck with outdated Android software that’s largely not optimized for E Ink so there are some trade-offs too. Amazon made a HUGE mistake with the the Oasis. In order to make room for a larger Kindle and price it competitively against the new iPad and Kobo Aura One, there’s no choice but to discontinue the Oasis and price the Larger Kindle somewhere in between. Nobody would buy an Oasis when you can buy a larger Kindle for $30 more and nobody would buy a larger Kindle when you can get an iPad for $30 more. It also makes no sense to buy a larger Kindle for $329 when you can buy a Kobo Aura One with more customization options for $199 USD. I have always wanted a larger Kindle, for many years I have taken surveys, polls, given my critique and opinion but Amazon has failed me and others and honestly it’s too late. With the the Kobo Aura One, Bookerly font, Calibre and patches from mobileread, I have everything I want and am not tied to any eco-system. Even if Amazon does release a larger Kindle, it wouldn’t match the flexibility and customization options I have with my current set-up mentioned. The larger Kindle would most likely still suffer from Kindle’s OS limitations, un-even lighting, thin fonts, no left justification options, awkward font sizes, limited line spacing and margins. For me to even entice the idea of purchasing it, it would need a whole new OS revamp with more features and customizations, a competitive price against my Aura One and offer something I currently do not have. And I can almost guarantee Amazon ain’t doing none of that. Amazon should fire the strategy/marketing people who got the Kindle brand into this stupid pot-hole. I have gone to Kobo Aura One after having bought every Kindle model available over the years. I am not waiting any longer for a Kindle 8 inch. Amazon probably hired the same boneheads that came up with the Firephone to take over the Kindle Department. Amazon sure comes up with software updates that make absolutely no useful impact. Faster page turns? Oh wow! Better dictionary? Like I care. Give me something that makes an IMPACT! I don’t care about Goodreads, how about integrating Audible? How about integrating Instapaper? Instead of giving us a nasty eye aching bold Ember font, how about giving us the option to adjust the weight to our hearts desire? Oh, and don’t even think about leaving a 5-star kobo review and even mention why it’s better than a Kindle because they’ll automatically think your bias and delete your review. Absolutely ridiculous! I have the original 6″ Kindle Touch. That has the features I need and use. I want e-ink for my reader. I like not having to charge my reader every day. The fonts, etc., are good enough for me, and I have other ways of connecting to internet. I don’t need a browser. I also, only a couple of years ago, bought a used original Kindle-DX (10″ e-ink). That is my favorite for reading, but it’s heavy to tote around. I like the text-to-voice, though I don’t use it a lot. I’d like to have paper-white, 10″, touch with text-to-voice, but I’d only be willing to pay maybe $150 for one. Amazon isn’t going to sell one for that, so I suspect I’ll have my Touch and my Kindle DX for years. I like them both, for different reasons. Both of them serve the purpose so well that the only reason I’d upgrade is a failure of both of the Kindles I already own, or the release of a paper-white, 10″ for <= $150. 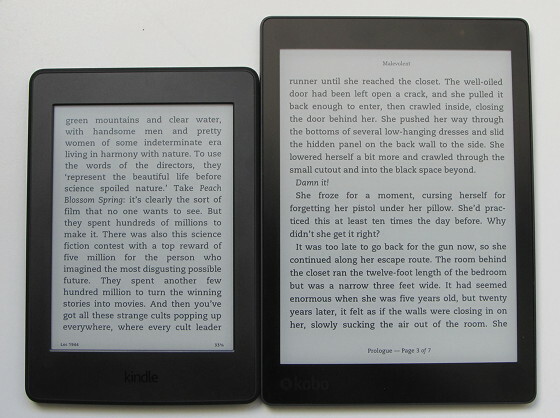 The one other thing I'd note is the both the Touch and Kindle DX are sold as non-glare. That's not really true. They don't reflect like a mirror or shiny glass, but that doesn't mean direct light doesn't adversely affect readability. I'm not asking for anything, just answering the posited question. Just way too many 6″ Kindles and I just don’t see where a $200 Oasis fits. I paid $230 for a 10″ Android tablet, so $250-$300 is the max I’d pay for an 8.something inch Kindle. Anything bigger and I’ll stick to my tablet, which I bought primarily for digital comics. I would love to purchase a larger kindle, especialy for those of us who read mangas on it now and then. Amazon offers to read mangas and comics on there devise and it’s not convinient at all I would definetly read those on my kindle more often it the screen was larger and I really think more peopole would if it was the wase. The screen should at least have the size of a manga which is basicaly the size of a regular paperback book. There is also those of us like my mom who have bad eye sight and like or read large caracters, and in those case to a larger screen would be needed. Forget, the others features like luminosity, or all the things that makes it more expensive. I love the voyage and would love to purchase the oasis, but a regular kindle paperwhite3 with 8″ 10″ would beat both. 100 to 200 dollars for those. Hi. Thank you for the nice article. I have only one question: why would you even mention Ipad in here??? I think, we already established the differences between tablets and e-readers. People don’t buy e-readers to check emails or surf the net. They buy them to read books and e-readers deliver the best experience. Ipad is good for reading short articles but not books! Unless you want to destroy your eyes. Spot on Mark. People don’t understand an eReader needs to do one thing and d it really well. The last thing I need on my eReader is email or other distractions. The 6″ kindles are just too small. I am constantly clicking page turn even with smaller font. I find it extremely distracting. I have been waiting for a DX replacement for years and am willing go pay whatever. I would pay $250+ for xl Kindle. Been wanting one for years.